2nd. Behind in the peloton Lucinda Brand (RaboLiv) sprinted to 3rd to complete the podium. With the bonus seconds and 11th on the stage Emilie was 4th in the GC after first day. Second stage started with sun, but it didn’t take long before the weather changed to rain and the temperatures dropped. It caused for a tough stage and some cold riders. Lucinda Brand got away and won the stage ahead of the peloton. In the peloton junior Susanne Andersen, who will ride with our team next year, won the sprint ahead of Thalita De Jong after an impressive finish. On third stage the sun finally stayed with the riders through the whole stage. On the local laps in Halden a group of seven riders managed to get away. 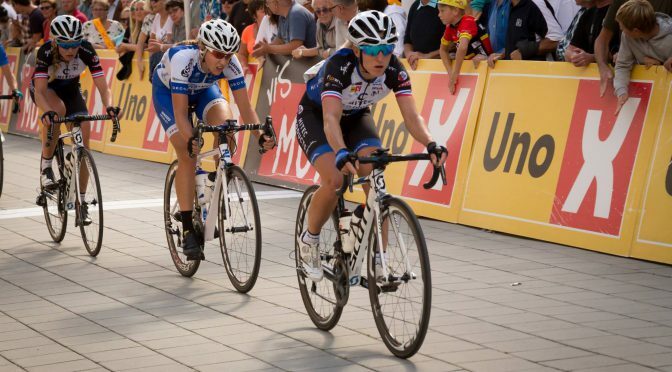 Emilie was our rider in the group together with overall leader Brand and her teammates De Jong and Anouska Koster. The RaboLiv girls kept the speed high to stay away from what was left of the peloton. In the sprint Koster won ahead of Emilie in 2nd and Christina Siggard (BMS-Birn) in 3rd. A strong finish in front of home crowd for Emilie and the team, who all worked hard through the weekend. Lucinda Brand won the overall whereas Emilie secured 5th. Our team this weekend: Miriam Bjørnsrud, Thea Thorsen, Tone Hatteland Lima, Cecilie Gotaas Johnsen, Lauren Kitchen & Emilie Moberg.